Easily configure Kiosk computers from a single screen, allowing a 2 minute complete configuration providing all automation & security necessary. Comprehensive Support for Public Kiosks. Kiosk Mode refers to a configuration where a computer boots, automatically logs on as some user, starts a single application (typically Internet Explorer), does not let the user close the application, and prevents the user from interacting with the computer, in any way, not controlled specifically by that single application. Fortres 101 allows for the easy configuration of computer Kiosks from a single screen, allowing a two minute complete configuration providing all automation and security necessary. Simply turn Kiosk Mode on, specify the Kiosk app or web page to launch upon logon, specify the auto logon credentials, save settings, and reboot. Upon the next boot the computer will log on as the Kiosk user and launch the web page or Kiosk program in full screen mode. The end user will be confined to the Kiosk application. Machines configured with Fortres 101 Kiosk software can be easily imaged, deployed, and centrally managed using Central Control. With Fortres 101 there is no need to go monkey funking with the finicky and fragile auto-logon mechanisms in Windows. Fortres 101 asks that you merely provide the logon credentials through a well-documented and easy to understand interface a single time. Without Fortres 101, for whatever reason (Windows Update, Interrupted Boot cycle, noisy network connections, etc.) sometimes the Windows auto-logon facility just stops working. With Fortres 101 the Windows auto-logon service is continually monitored and then repaired automatically whenever necessary. With Fortres 101 there is no need to go monkey funking with the finicky and fragile auto-logon mechanisms in Windows. Fortres 101 will launch anything that you need it to during startup to kick off your Kiosk application. There is no need to edit the registry, drop things in startup folders, create shortcuts, bind command lines, etc. Fortres 101 makes it easy to specify a starting web page, file, or application (with or without command line parameters). And it is easy to test your configuration without rebooting or even closing the Fortres 101 interface. 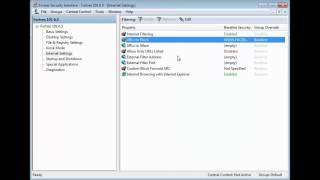 Fortres 101 allows control over what keystrokes are sent to the Kiosk application, making it easy to block the features of Internet Explorer (or any other application running in Kiosk Mode). Of course Fortres 101 can block (and by default, in Kiosk Mode, it does block) CTRL-ALT-DEL and all other system attention, shell attention, and window manipulation request key combinations (ALT-F4, CTRL-ESC, Windows Key, ALT-Tab, etc.). The Kiosk Mode feature set is built on top of Fortres 101, the most robust, flexible, and feature rich restrictive security application for Windows. With over 60 thousands customers from every state and over 50 countries, Fortres 101 has the mileage and stability to easily protect Kiosk software environments. Learn how Fortres 101 is the solution to malicious or accidental destruction of computers, problems with inconsistent interface, and inconsistent printing behavior. 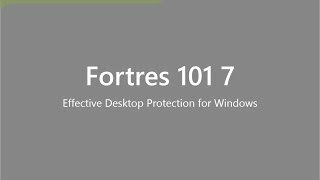 Since Fortres 101 does not rely on Windows Group Policies, all security can be turned on and off without rebooting or logging on as a different user, or without even closing the Kiosk application. Also, Central Control allows for the easy remote configuration of all Fortres 101 security and Kiosk features. Kiosk machines can be configured individually or in groups of thousands. Fortres 101 has a no risk full product trial available as a simple download. Set up your Kiosk with Fortres 101 right now. Once you decide to deploy, there is no reinstallation required. Fortres 101 installs with default security parameters perfectly tuned for Kiosk deployment. No knowledge of Windows security details or configuration best practices is required. Simply install Fortres 101, open the interface by pressing CTRL+SHIFT+F, visit the Kiosk Mode page to enable and configure, and save your setup. Two minutes after installation you can have your Kiosk machine securely functioning and ready for service. Fortres 101 is that great application that does not become a part of your life. After you install it and configure the Kiosk Mode, it will never need your attention again. Download it today. Central Control allows an administrator to configure all of the Fortres 101 and Clean Slate installations from one location. For more information on Central Control, click here. Enhance Fortres 101 security with Central Control network software. 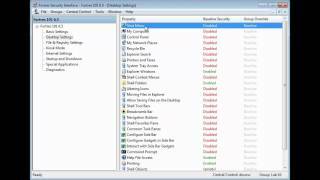 Quickly enable/disable security for all computers. Control Fortres 101 security based on computer, user, or group. Shut down, log off, and restart remote computers. Customize Fortres 101 security based on computer, user, or group. Upgrade/update remote Fortres 101 installations. Builds on existing LDAP network of users of groups. Create, delete, and edit users and groups. User and group settings follow the user to every computer on the network. Supports 32 Bit and 64 Bit Windows 2016/2012/2008 Server and can read users from any LDAP server. Please Note: Fortres 101 is designed to be installed on desktop operating systems. We do not recommend installing Fortres 101 on a Windows NT Server, Windows NT Terminal Server, or Windows 2000 Server computer. As such, we do not provide technical support for Fortres 101 when it is installed on these network operating systems. As the School Technology Coordinator for Woodford County High School in Versailles, IY, Linda Cook found an easy way to stop students from breaking into the school's computer system. About five years ago, she purchased software from Fortres Grand Corp., based in Plymouth, IN, and to this day, hasn't experienced any problems from hackers. Several student hackers have tried to get around (Fortres 101) but haven't been able to break into the system. I've even asked some of them to try to do it right in front of me. For the past five years, no student has been able to do so. The software has been a lifesaver for my computer labs and our school system as a whole. – Review Published in Media and Methods Magazine. Anyone got any bright idea of what I can do being able to run a command.com from the emulated Windows 98 DOS prompt. Since it is running from the Windows shell, and Fortres is enabled on the Windows machine I want to gain access to, the restrictions are all the same. For some stupid reason our admin enabled the command.com option, probably as a backdoor for himself somehow. I tried renaming/deleting/moving files from there but it wont let me since Fortres is running. I also tried to edit the config.sys and autoexec.bat, but no luck. Any ideas? ?